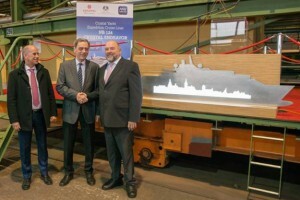 The first piece of steel has been cut for Crystal Cruise’s new ship Crystal Endeavour, which is due to enter service in 2020. Crystal Endeavour will be a new luxury expedition yacht. This will be Crystal’s second expedition yacht, following on from Crystal Esprit. The ship has now adopted a new appearance compared to the original renderings, as pictured on the Crystal Endeavour page on our Sovereign website. Crystal have decided to implement a more sophisticated, contemporary design for the exterior of the ship. In attendance at the steel cutting ceremony was Crystal President and CEO, Tom Wolber; Genting Hong Kong Chairman and CEO, Tan Sri Lim Kok Thay; Mecklenburg-Western Pomerania’s Economics Minister, Harry Glawe; and Stralsund Mayor, Dr. Alexander Badrow. Pictured left to right: Crystal President & CEO, Tom Wolber; MV Werften CEO, Jarmo Laakso & Mecklenburg-Western Pomerania’s Economics Minister Harry Glawe. When the ship enters service in 2020, it will be one of the most innovative expedition yachts in the industry and the largest “megayacht” in the world. The yacht will boast exciting features such as helicopters, submarines, zodiacs, jet skis, wave runners, kayaks, scuba diving/snorkeling equipment, dive-support tender and a multi-person ATV. If you are looking for new exhilarating ways of exploring on land then this yacht will be perfect for you. We will announce more details regarding the ship as it gets closer to her launch date. For the very best fares & expert advice on all Crystal voyages, please contact The Sovereign Cruise Club!